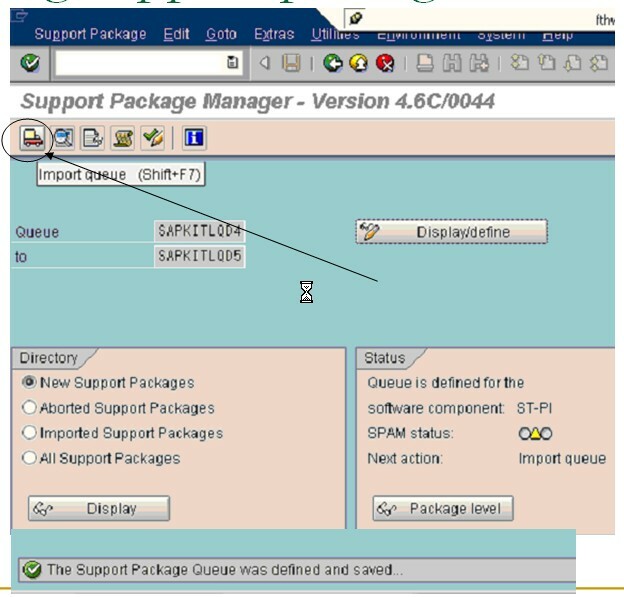 SAP Support package's are used to enhance the functionality or bug fixing in the program, it contains a collection of error corrections. 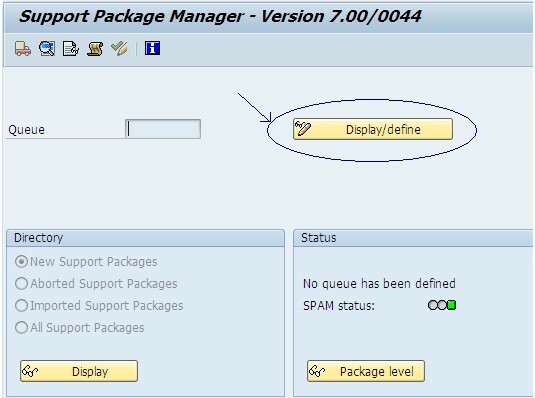 You can only import complete Support Packages and in a specified sequence. 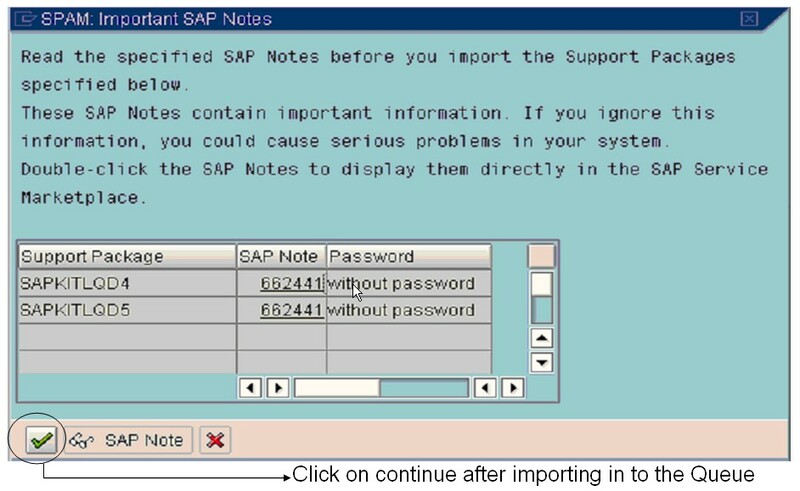 Each correction in a Support Package is documented in an SAP Note. Before applying support package there are certain prerequisites which need to be checked. Each Support Package is valid for only one release (but for all databases and operating systems) and requires an exactly defined number of predecessors. The upgrade of the following release or correction release contains all the Support Packages of the previous versions that were available up to the delivery of the upgrade. A SPAM/SAINT Update (PAT) contains updates and improvements to the Support Package Manager and the SAP Add-On Installation Tool. 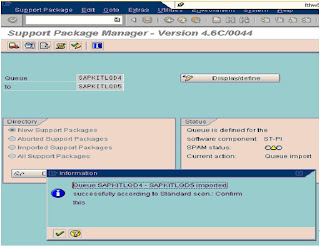 A Component Support Package (CSP) is valid for one software component (SAP_BASIS, SAP_HR, SAP_APPL, Add-On Software Component...) and contains quality improvements for Repository and Dictionary objects in this software component only. In addition to these improvements, Support Packages for the SAP_HR component also contain adjustments due to legal changes. SPAM and SAINT version should be latest. Go through the OCS (online correction support) note before doing support package. There should not be any aborted packages which were applied earlier. Login to 000 client with user like DDIC. Suspend all background jobs using report BTCTRNS1 except background jobs like RDD* jobs. There should be at least two background work process reserved for this process. 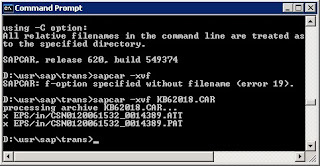 Check for enough space in eps/in directory (os level) \\usr\sap\trans\eps\in take successful backup. Apply patches in the sequence defined in the composite note. Patches can be applied individually or bundled together. 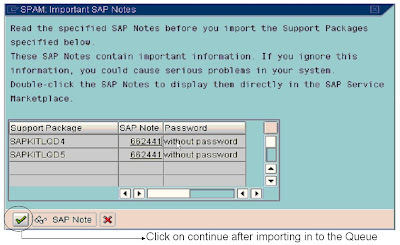 Patches can not be revert by consultant, only SAP can revert the patches by developing a negative patches if required. Schedule downtime before going to apply support packages. Notify user through email or by creating a message SM02 transaction. Lock all user’s, except BASIS Admin users, DDIC and SAP* for Make sure no user should be logged on while performing support package. In order to avoid network congestion the files which are more than 10MB has to be applied through “Application sever”. Patches which are less than 10MB can be applied through “Front end”. “tp” version should be latest and also upgrade the Kernel version. Support package should be applied in the sequence of landscape, First in Dev system and next apply in QAS for the consistency test and finally in PRD system. Note: You require the authorizations S_TRANSPRT and S_CTS_ADMIN to be able to run transaction SPAM. These authorizations are part of authorization profile S_A.SYSTEM. 1. 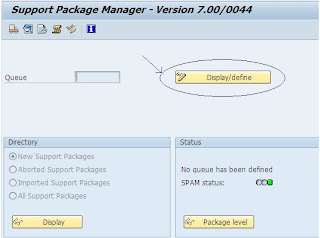 Click on Package level to know the existing level of the support packs and the add-ons. 2. Go to transaction SPAM and Load the support packages from frontend if it is < 10 MB. The support packages which are in the form of .car will be decompressed into eps/in directory. 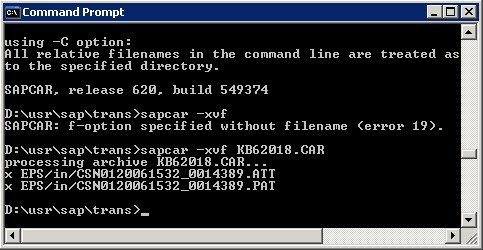 The command SAPCAR will decompress the CAR file and put two files (with extensions .ATT and .PAT in the /usr/sap/trans/EPS/in directory. 4. A box will appear with the Support Package categories, Click on the category for the support packages that you uploaded and it will list them in order. You can apply them individually or the whole list at one time. 5. Go to support package click import queue (or) Click on truck icon. 6. Click on continue after importing in to the Queue. When the support packages contains any changes in the data dictionary then this phase is invoked. When the support packages contains the changes related to repository objects SPAU phase is invoked. it prompts whether to keep to existing changes modified by notes or adapt to changes. 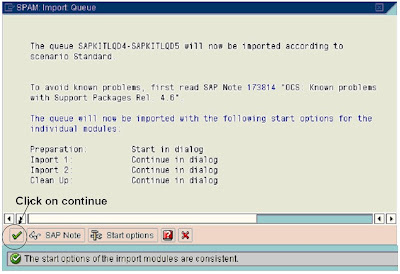 Use : - If SAP modified objects that have also been modified by the customer, a modification adjustment is executed in the transactions SPDD and SPAU during import of Support packages. Create two change requests in the Workbench Organizer (transaction SE09), one for the modification adjustment with transaction SPDD and the other one for the modification adjustment in transaction SPAU. Create a task for each developer who is involved in the modification adjustment. The developers must use transactions SPDD and SPAU to determine whether to retain or delete the modifications. After modification adjustment is finished, the developers must release their tasks. 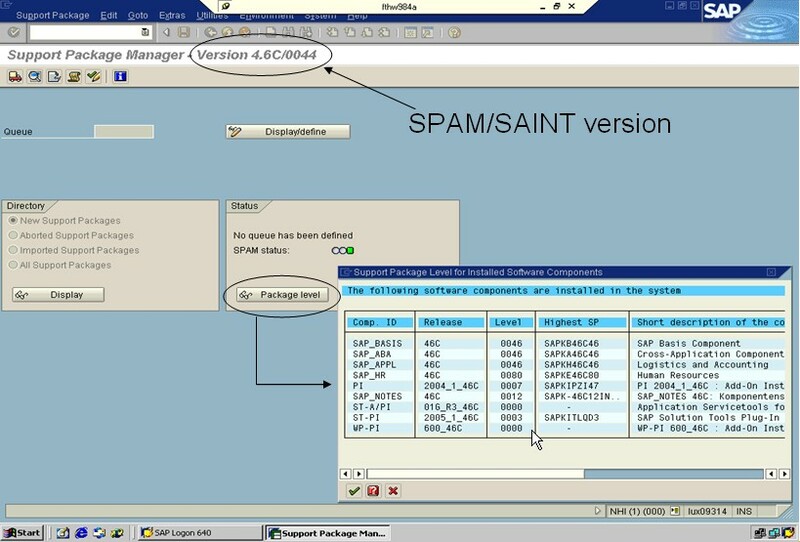 Use transaction SPAM to access the SAP Patch Manager. Choose Patch -> Import Patch Queue. A confirmation dialog window appears. Choose Enter to finish the import process of the Support Package. Release the change requests that result from the modification adjustment using transactions SPAU and SPDD. 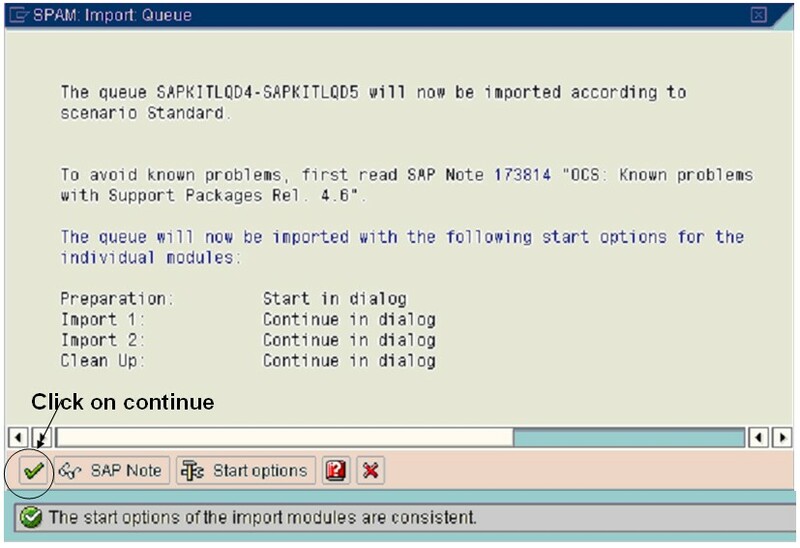 At a later time, you can use the change request of transaction SPAU to import the modification adjustment after this patch queue has been imported into other SAP Systems within the system landscape. You cannot use the change request of transaction SPDD to avoid the required SPDD adjustment during import into other systems. You must always re-adjust the Dictionary manually. However, you should still transport the change request to ensure that identical modifications are made in all SAP systems. Before importing the change request resulting from the modification adjustment with transaction SPAU or with transaction SPDD during import of a patch queue into the subsequent systems, import the patch queue itself. 9. It prompt you the Queue is imported successfully and ask to confirm the queue. 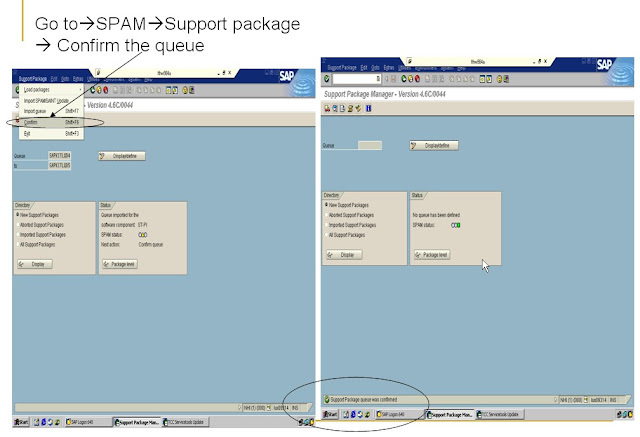 This shows the support package has implemented for the one of the queue and you need to do the same as for the other queue (software components). 1. Check if any alerts or error messages in SICK and SM21. 2. Release all the background jobs (BTCTRNS2). 3. Unlock all the users. 4. Run SGEN ( SGEN compiles all programs.SGEN reduces abap load on the system). 5. Take a successful backup. No enough space in eps/in directory. 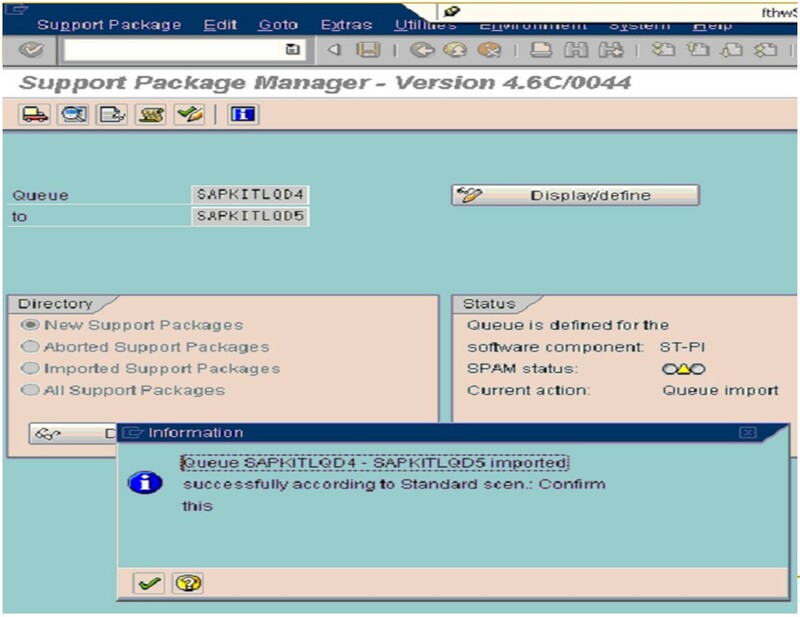 STMS configuration should be consistent. "tp" and "R3trans" is outdated or obsolete or corrupted which needs to be updated. Background jobs is terminated with memory related issue.